Saute onion, pepper and garlic (add last) with the meat (in olive oil? See this post for research!). 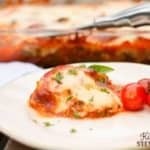 Pour a little spaghetti sauce in a 9×13 glass baking dish. Layer 1-2 large sliced zucchinis on top. Mix the remaining spaghetti sauce in a large bowl with the sauteed meat and veggies and the fresh basil. Layer sliced tomatoes (they don’t have to be Romas, but those are prettier) on top, then cover with mozzarella cheese and Parmesan cheese. Cover and bake at 350 degrees for 30 minutes, then uncover and bake for 15-30 minutes longer, until the cheese is browned and the sides are bubbling. *Note: If you want to make sure the zucchini gets soft, you can optionally parboil it for a few minutes before layering in the pan. I skip that step because I hate making more dishes! Also, the dish will be pretty watery at the end if you use raw zukes, so either parboil, roast on a cookie sheet, or slice/shred and salt the zucchini and drain well before layering. Since I’m learning so much about the dangers of aluminum, I chose to tent the aluminum foil so it didn’t really touch the cheese. You can also put parchment paper under the foil so it doesn’t touch the food OR simply invert a cookie sheet over the baking dish. If you roasted your zucchini, use the same cookie sheet as the “lid” above.